OVERALL IMPRESSION: This book brings back some memories for me. I remember getting the information about who my college roommate was going to be and contacting her to figure out who would bring the fridge and who would bring the microwave. That was about all of our communication until we met on moving in day. 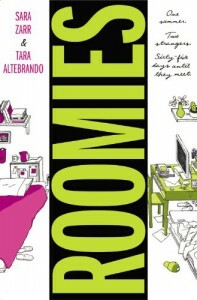 This book takes it farther and the two girls continue to e-mail each other and form a friendship before they even move in together. It's a really interesting concept and I love the idea that they are from two completely different worlds. I actually live in the bay area, so I enjoyed hearing the references to the city and places that I have been. It was just really neat hearing about these places I've actually seen. This is a really quick and light read. I feel like it's a good "palate cleanser" to read between heavier books. While it's not necessary, I'd love to see a short sequel of the girls' interaction and how things go during their first year of college, actually living together. I think that would be fun to read about. CHARACTERS: I liked both Lauren and Elizabeth. I like how their lives are completely different, but they are still both teenage girls with the same internal issues. COVER: I like it. It's cute!